Mosque or a Masjid is is the holy place for muslims faitfuls for offering namaz/salat or prayers. Jammu and Kashmir and its archeological and heritage plays a huge role in the overall culture and archeology of India. The state is famous for its concept of Kashmiriyat and for respecting and upholding signs and symbols of several pilgrims and religions. The state houses several Islamic monuments, Masjids and Dargahs which exist in utmost peace with the several important Hindu shrines and pilgrimages. Apart from the several important Hindu pilgrimage points, Kashmir is also a house of a major Muslim Population and hence the concept of Mosque is very obvious. Every town in Kashmir has a mosque. For people who believe and have an interest in the Islamic culture and architecture, the Hazratbal and the Chrar – e – Sharif are some of the sites that one should not miss. Situdated just on the banks of the famous dal Lake, Hazratbal Mosque stands peacefully on the soild of a village which shares the name with the mosque. The white marble elegance of the shrine is reflected in the waters of the lake. The presence of a relic makes the mosque even more significant, Called as the Moi-e-Muqqadas, This relic is actually a hair which people assert is of Prophet Muhammad (pbuh) himself. On several religious celebrations, the hair is also put on display. The only mosque with a dome in all of Srinagar, Thousands throng the masjid here and the number specially swells on Fridays. Standing right on the western end of the picturesque Dal Lake bang across Nishat Bagh, The Hazratbal Mosque makes the eyes look long at the sight of the mountains and the lake. The place has been blessed with various other names such as Assar-e-Sharief, Dargah Sharif , Hazrat bal and even Madinat-us-Sani. Often considered as the holiest of all shrines in Kashmir, Hazrat Bal owes its etymology to Hazrat and Bal. Hazrat in Arabic menas Holy, While Bal in Kashmiri is used for place. Sultan Sikandar, In the year 1385 cmmissioned this huge Jamia Masjid which is now known as the Jama Maslid. Owing to the Masjid’s magnificent t Indo-Saracenic architectural brilliance and the religious practices of the Kashmiri Muslims, The Jamia Masjid or the Jama Masjid is frequented by vistors round. 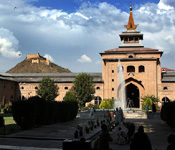 Acting as the finest example of its architecture, the jamia Masjid with the support of 370 pillars, hads stood as one of the most holy and beautiful monument of Jammu and Kashmir. The total area covered by the historical masque equals to 384 feet by 381 feet which can accommodate more that 33,000 people during a single congregational prayer.With its high roofs, Huge Minars and extraordinary designing grammar, The Jamia Masjid ius used by beileivers to offer prayer in a congregation at an altitude which is no less than that of Kashmir. The Pather Mosque –The River Jhelum makes way for this glorious mosque which stands gracefully immediately beneath the Shah Hamdan Masjid, The Pather Masjid was created completely from marble in 1620 by Noorjehan , the emparess. 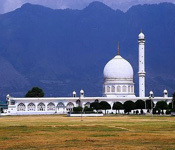 Also famous as Amir – I – Kabir, The Mahadan Mosque is one of the most important mosques in Kashmir. The erstwhile royal Sultan Qutab-id-Din commissioned the construction of this masjid in the year 1835. A fascinating fact about this masjid is that even a single screw or nail was not to be sued in its building. Fire had the best of it twice. Once in the year 1731 and before that in the year 1475. After its destruction in 1731, Abdul Bharat Khan renovated and almost rebuild the mosque in the following year. Crafted totally in wood, The Hamadani mosque owns its name to a sacred religious leader who had many locals turn to Islam in peace.He established a masjid in the nearing town of Ley and still is a major attraction. The Khangah is made totally by the wood and key characteristcics include wonderfully impressed attic and lynching chimes. The interiors are richly carved and painted, and the antique chandeliers give it an air of opulence. Second only to the Jamia Masjid, This mosque named aali Masjid ins the largest Masjid in all of Srinagar. Sultan Hassan Shah;s rule saw the building of this mosque way back in the year of 1471.The Cultural Resource Mapping of the city of Srinagar which is done by the J & K Chapter of INTACH, undertook the conserbvation and protection of this mosque and has done a good job. Considering the extensive wreckage Kashmir’s architectural legacy, particularly that of spiritual places like masjid’s etc; the INTACH’s Kashmir Chapeter felt they must undertake the preservation of one sacred building to act like an example to make an impression on the way time-honored monuments should be conserved, protected and restored. 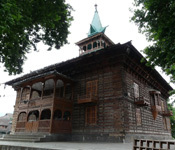 The Aali Mosque is a fine illustration of the local timber structural design of Kashmir. Going through a long list of people, from Mughals to Dogrs who were the last to restore this Masjid.